I’m a little late in coming around to the animal hide trend. For a long time it didn’t speak to me; I guess I wasn’t entirely comfortable with it. But I must confess, it has slowly grown on me! 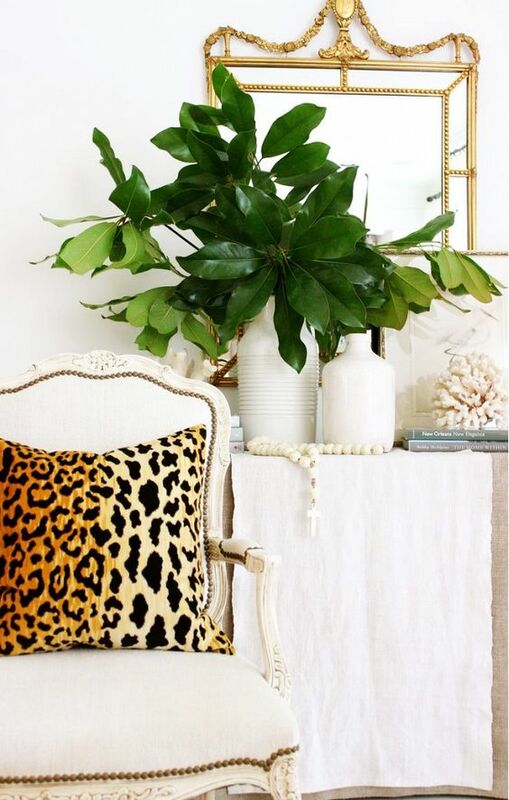 Decorating with animal hides can not only look luxurious, but it also brings much needed texture to a room (something that is often missing in interiors). 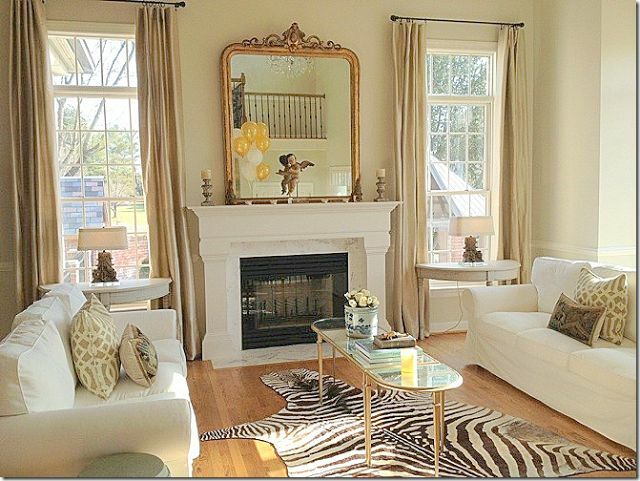 I’m especially drawn to a zebra or cheetah print rug layered over another natural fiber rug underneath. So chic! A lot of people aren’t comfortable with it being real animal skin (I’m still not sure I am!) but with all the faux options now, that doesn’t even have to be an issue. Rest assured that any skin you see that looks like a zebra or a cheetah, is definitely cowhide that has been printed. The former are illegal and have been for a long time. But even for those opposed to using cowhide, there are amazing faux choices to be found. 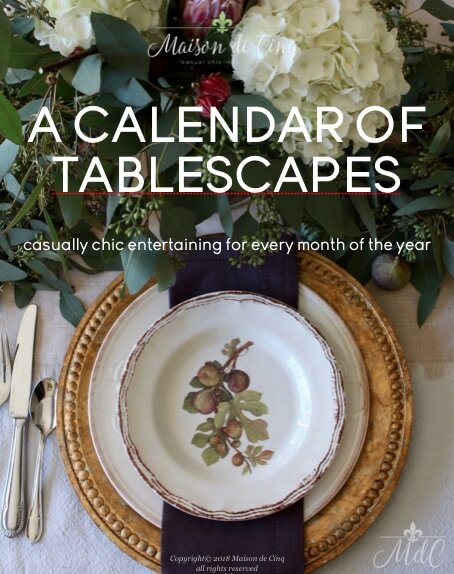 They bring an eclecticism and exoticism that not much else can, and they’re a classic. And you know I love that! Also, hides and skins are relatively child-friendly; they wear very well, and they repel stains better than silk or wool rugs do. Perfect! I’m seriously in love with this space! 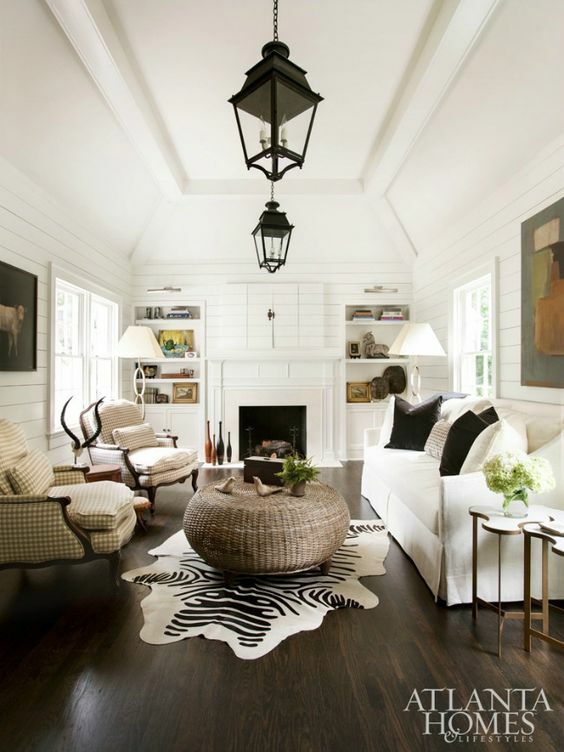 The zebra rug looks so good on top of wood floors. Via TG Interiors. All the white with the zebra – beautiful! 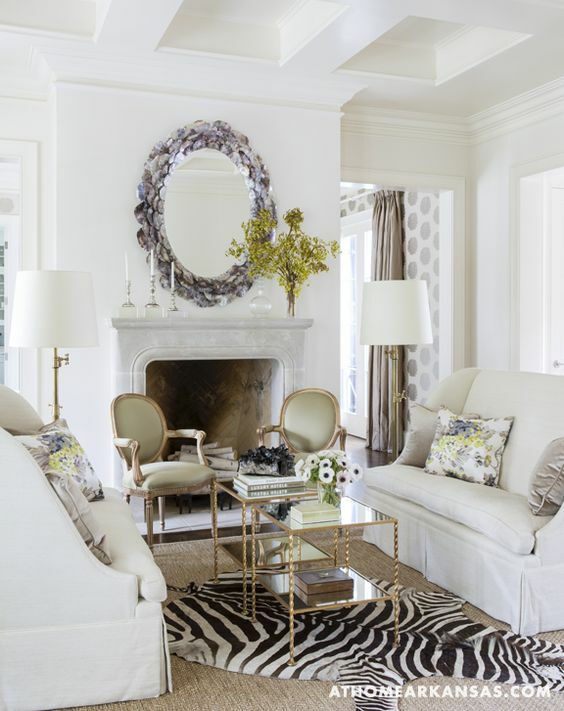 Melissa Haynes Design via At Home in Arkansas. 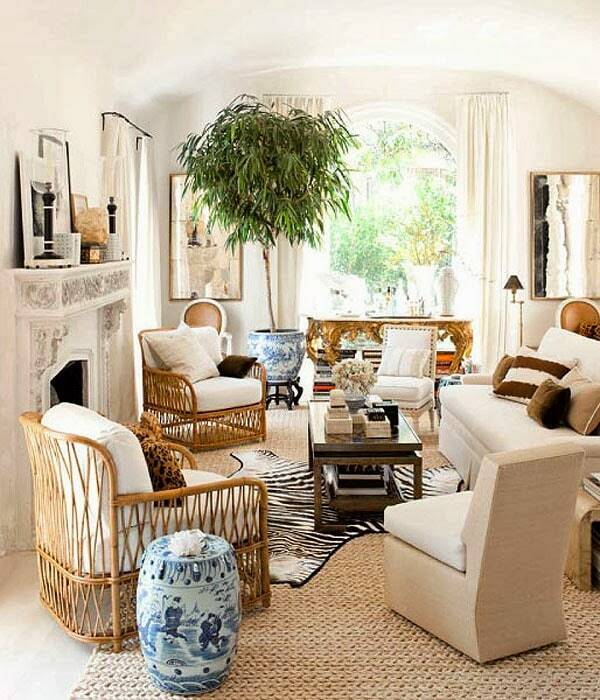 This living room is by one of my favorite designers, Mark D. Sikes. He uses animal hides quite frequently, often layering them over sisal, seagrass and other natural rugs, which is such a great look. 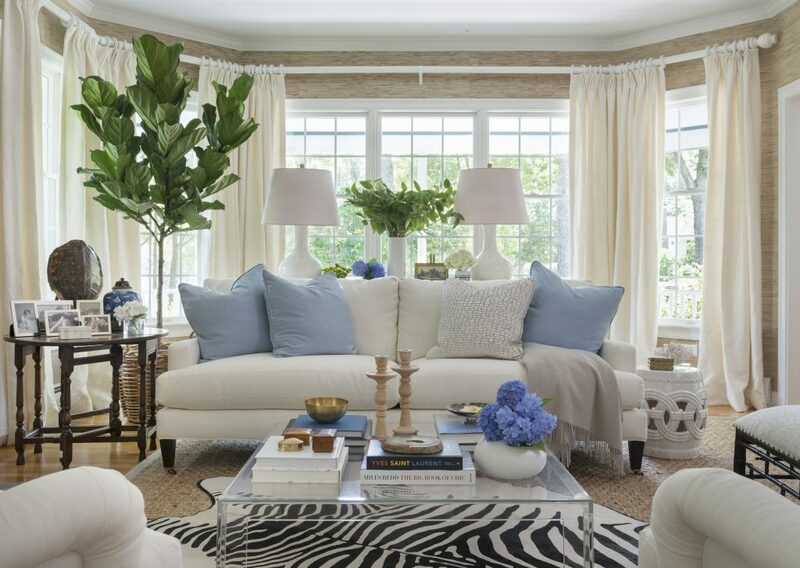 Blue and white living room with a lucite table and a zebra rug. Design by Kate Jackson. Another favorite designer! By Jan Showers. Via the blog, Nubury Lane. 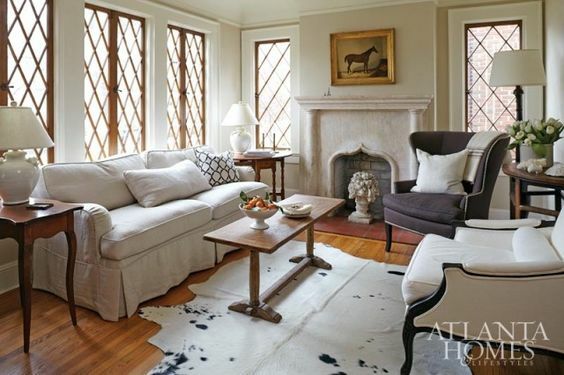 Classic design + zebra rug = match made in heaven! 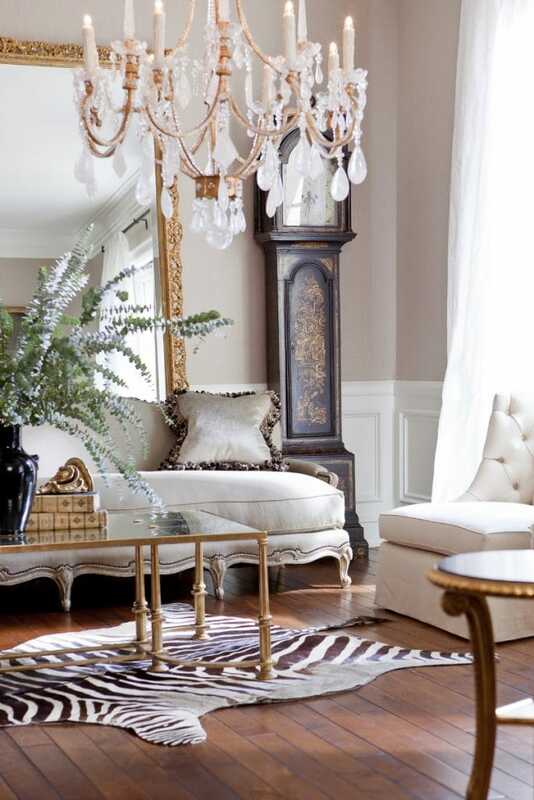 Design by Nikie Barfield via Atlanta Homes. Such a favorite. I think I’ve pinned this picture about 20 times! Joy Tribout Interior Design. 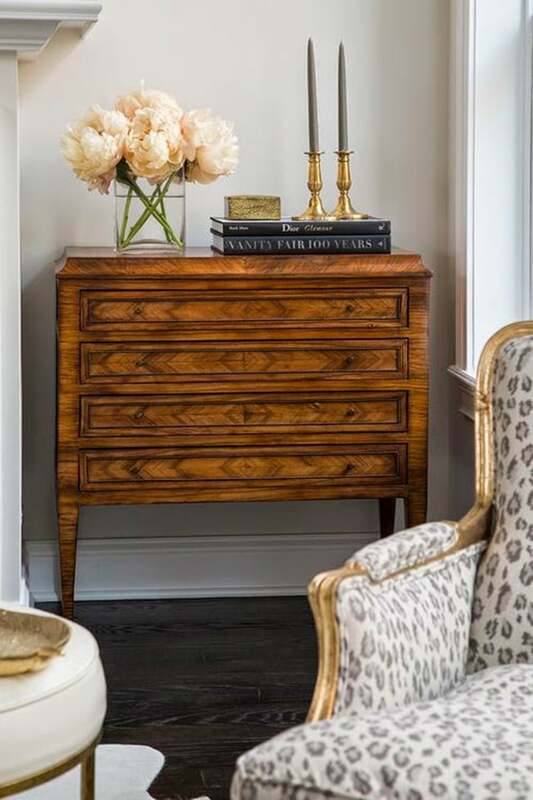 Via Atlanta Homes, design by Huff Harrington. Love this room! Traditional kitchen, with a twist. By Pimlico Interiors. LOVE this on the stairs! 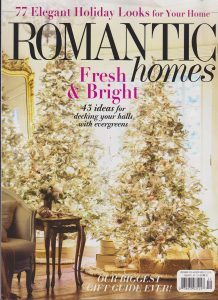 Gideon Mendelson via House Beautiful. 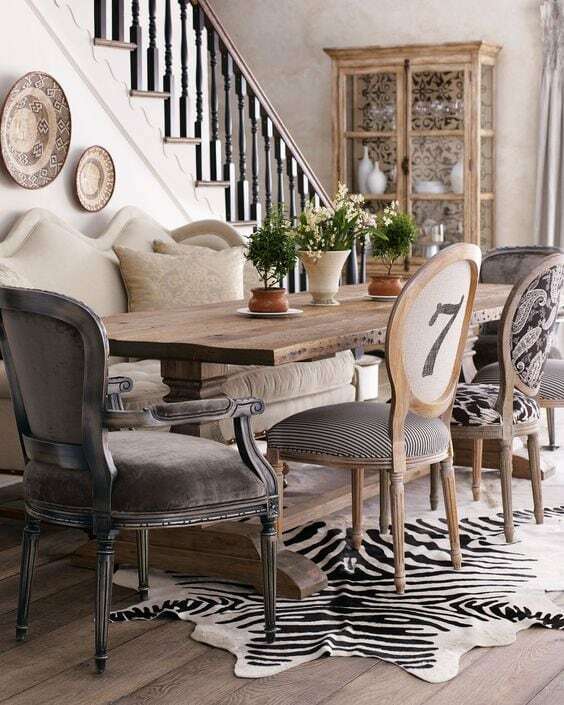 I love this dining area with the mismatched chairs and the zebra rug. Lovely! Via Horchow. 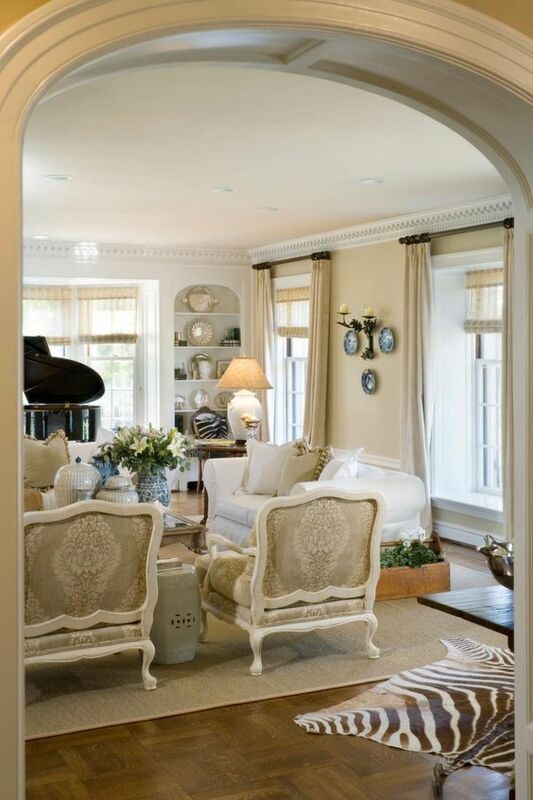 Designed by Betty Burgess via Southern Accents. 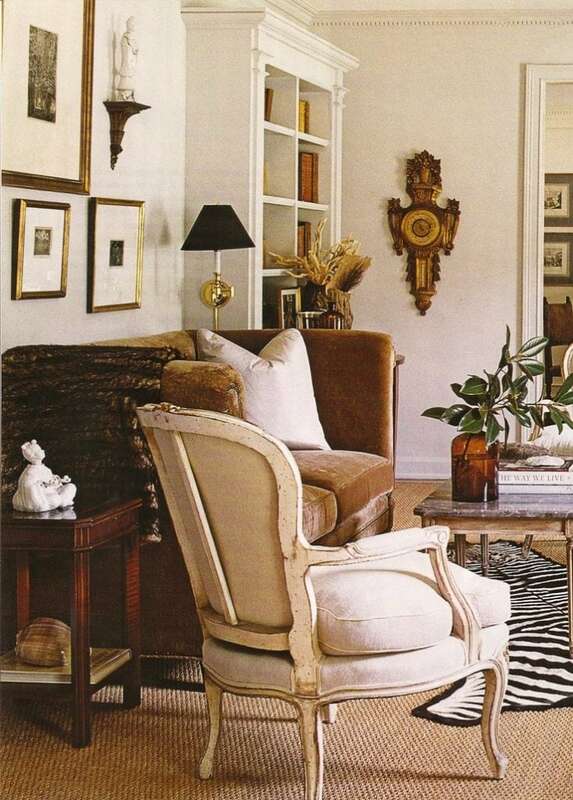 I love that animal hides work in any design scheme, whether it’s contemporary, traditional, eclectic, or even rustic. It always adds that effortless chic that we all want. And if you’re shy about a zebra rug, or it just isn’t your thing, try a zebra print on a chair or bench or a leopard print pillow. It is less showy, while still giving the same chic effect! I adore this soft printed leopard chair! The epitome of chic. Wendy Labrum Interiors. Timeless, sophisticated, chic. I’m thinking decorating with animal hides is here to stay! Gorgeous inspiration here Sheila! I am in the market for another faux hide rug. Pinned a bunch! I’m looking for one too Kelly! They add so much to a room – love that you already have one! Thanks for stopping by – and happy almost weekend! I love your post! Regarding zebra skins, many are bought or ordered from legitimate companies where the skins were from culled herds. There are some zebra species that are illegal to sell the hides and others that are perfectly ok. It’s the same with other hides such as reindeer, etc. you can look on Amazon or EBay. Mine was bought at a store in South Africa and came with a certificate stating it was legally bought and (esp.!) tanned. Another popular hide is Impala or Kudu, similar to a deer hide. I have a thirty yr old Impala hide hanging over a staircase railing. The textured look is lovely. 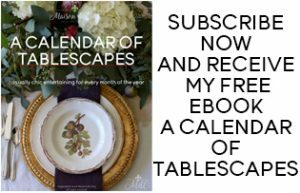 Thanks again for rather lovely post! I’m so glad you enjoyed the post Barbara. And thank you for all the hide info. It is so helpful to hear from readers, especially when you know more about a subject than I do! I originally thought all zebra skins were illegal, but apparently that isn’t the case at all. I do know that most of what is here in the U.S. (buying new, that is) is from cowhide, and is a by-product of the meat industry. I bet your house is beautiful with all that lovely texture. Thanks again for visiting, and for sharing. I truly appreciate it! 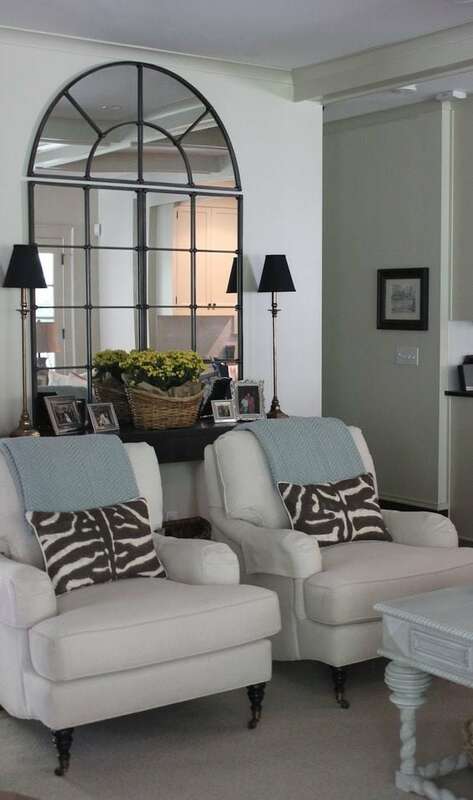 I love decorating with animal prints too! Thanks for the great post. Love the post but more than half the zebra hides are real zebra, unlike the “big cats” skins they are not illegal. Printed cow is much less expensive than a real zebra. Tip for those using a hide as a rug, they look and lay better when they are “felted”, you can tell when they are felted by the black band along their perimeters. Keep up the posts, love your blog. Thanks so much for writing Mary, and for the info. I thought genuine zebra rugs were illegal (they should be). However, all the ones I listed and sourced in the post are printed cowhide. Good tip about the felting, too, thank you for that info. Just loved this post!! I have so many of these images pinned! Thanks so much for stopping by and taking time to comment.